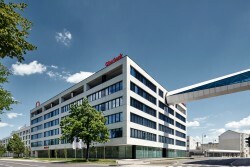 The Linz-based Oberbank has achieved strong results in the first half year of 2012. Profits remained stable. According to CEO Franz Gasselsberger, Oberbank could surpass the expectations for the first half year. Gasselsberger emphasized that the business atmossphere was highly difficult. Oberbank´s pre-tax profit was up by € 3.5m to € 73m. Net results remained stable at € 59.9m.